St Anne’s has its home in St Mary-at-Hill, the first Wren church to be built after the Great Fire of London in 1666. It replaced a medieval church dating back to the 11th century, whose bells were rung for the coronation of King Henry VIII in 1509. Wren’s almost-square interior has a modest, coffered dome, and barrel vaulting on a Greek cross plan, all supported on four Corinthian columns. The walls have dark wood wainscoting, and some elaborate stone memorials to the great and the good. In the 1960s, John Betjeman praised it as ‘the least spoiled and the most gorgeous interior in the City,’ but all the furnishings, including a monumental pulpit and box pews, were lost in a fire in 1988, so the interior is now quite Spartan. However, the west gallery has a fine organ built by William Hill in 1848, which is described as one of the ten most important organs in the history of British organ building. St Anne’s (unlike its host church, which, like many City churches, offers weekday services but no Sunday services), puts on Sunday services throughout the year, including a sung eucharist at 11.00am. St Anne’s is also home to London’s Swahili speaking Lutheran congregation, which meets twice each month for worship and Bible study. St Anne’s has been offering regular Bach Vespers in the City of London for over 35 years. 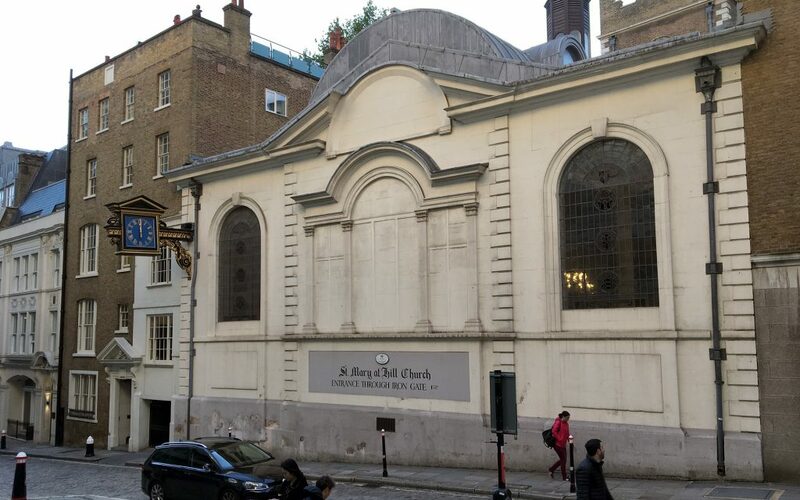 The church is in Lovat Lane, in the heart of the City of London, and is a stone’s throw from Pudding Lane, where the Great Fire of London broke out in 1666. It is an area of big contrasts: the medieval street plan survives in many places, but from the lane in which the church sits, you can see both the towering modern spire of the Shard across the river, as well as the overbearing commercial building known as the Walkie-Talkie, because of its strange shape, which looms over nearby Eastcheap. The church is a short uphill walk from old Billingsgate Fish Market on the banks of the Thames. Billingsgate Quay was an important harbour in the 10th and 11th centuries, and the fish market thrived here until it was moved to East London in 1982. The historic link between St Mary’s and Billingsgate is maintained in the church’s annual fish harvest service, which features a wet fish display donated by the market’s fishmongers. The service leader and preacher was the Lutheran pastor of St Anne’s. The music was provided by the City Bach Collective, a group of professional musicians who perform Bach (and the music of Bach’s contemporaries) on period instruments. Bach Vespers. These regular services at St Anne’s feature a cantata written by Johann Sebastian Bach for the specific Sunday, using the relevant gospel readings. This week’s piece, the cantata for the 17th Sunday after Trinity, Wer sich selbst erhöhet, der soll erniedriget warden (Whoever exalts himself will be humbled), BWV 47, was therefore heard in its original setting at the heart of a Lutheran service of worship. There were a few empty seats, but otherwise the church was pleasantly full of people who looked enthusiastic about being there. I think there were probably just over 100 people there. A very helpful lady sporting leopard-skin shoes asked me and my friend if we’d been to St Anne’s before, told us how long the service would be, gave us a service sheet, and pointed out the way to the loos. The wooden box pews were all badly damaged in the 1988 fire, so we sat on individual chairs upholstered in red fabric – which seemed OK in the comfort department, even though they were disappointing to look at in such a fine building. Buzzy and expectant. Several musicians were tuning their instruments, and most people in the congregation were checking their service sheets as the strings bent this way and that in search of perfect pitch, and the oboes discharged themselves of squeaks and squawks. The service leaflet gave us everything we needed, including a translation of the German words of the cantata, plus the musical notation for the hymn, the Lord’s Prayer, and the creed, all of which we sang. The service was accompanied by eight instrumentalists playing chamber organ, violins, a viola, a cello, a violone (a six-stringed baroque instrument, slightly larger than a cello), and two oboes. In the gallery above and behind us was the church’s very fine William Hill organ, with its broodingly black case and golden pipes. We were serenely floating along with the organ on the beautiful melody of Pachelbel’s chorale prelude, Herr Christ, der einig’ Gottes Sohn (Lord Christ, the only Son of God), when the trombone pedal part kicked in, and we all sat up as the bass notes, several storeys deep, let rip. It felt like a scene from Game of Thrones. It was very 1720s, as intended. We were transported back in time to an approximation of worship as Bach experienced it, with his cantata in its original and proper setting of a Lutheran church service. 7 — The pastor preached very well, even though the acoustic of the building was against her. The classical space, with its dome and vaults, is wonderfully resonant for music and singing, but its echoes muffle the spoken word, so I spent most of the time deciphering rather than taking it in. The gospel reading was Luke 14:1-11, where Jesus tells a story about humility, in which a wedding guest is asked to give up his coveted posh seat for someone who is socially superior to him. The sermon followed both the reading and the cantata by reflecting on humility. Our preacher told us that the word humility originates from Latin humilitas, which literally means ‘on the ground.’ This groundedness creates openness and freedom to engage with others in non-patronising ways. It recognises others and their needs. I really liked the groundedness connection. Our soprano had a wonderful, pure voice, and when she turned up the power, it was like a window opening in heaven and beauty pouring out. Sadly, she only had one short aria in the cantata. The most infernal moment came in a section of lyrics in the cantata that describe human beings as Kot, Stank, Asch und Erde (filth, dust, ash and earth) – and as if that wasn't bad enough, also as Teufelsbrot (one of the Devil’s brood). It reminded me of the memorably salty language of Martin Luther. I found myself near one of the singers and couldn’t help asking how the acoustic of the church had been for him. He said the church was near perfect musically. We were treated to some very decent filter coffee, accompanied by top-quality biscuits. 10 — I’m hoping to go again, as there are two more services of Bach Vespers at St Anne’s before Christmas.